It bans single-use plastic bags, establishes congestion pricing for driving into Manhattan and ends cash bail for most misdemeanors and nonviolent felonies. The State Capitol in Albany on Jan. 14. Photo Credit: Newsday / J. Conrad Williams Jr.
ALBANY — The first fully Democratic-controlled State Legislature in years passed a $175 billion budget early Monday, changing commuting costs, criminal trials and bail, car rides, drug treatment and visits to the grocery store. The plan calls for imposing tolls on drivers for entering Manhattan south of 61st Street. The level will be set by a government-appointed commission, but previous estimates put the fee for cars at more than $11. The idea is to reduce gridlock, encourage the use of mass transit and generate money to repair the crumbling New York City subway system, as well as to help the Long Island Rail Road and Metro North commuter rail. Beginning in March 2020, the state will ban single-use plastic bags such as the ones used at grocery and convenience stores. Counties and cities also will have the option of imposing a five-cent fee on paper bags. A ban on single-use plastic bags in New York would be combined with another component: a five-cent fee on paper bags that counties and cities would have the option of imposing. Enter the number of bags you use during a normal week to see how much the paper bag fee would cost. Changes include setting tighter deadlines to protect defendant’s rights to a speedy trial, giving defense attorneys evidence or “discovery” materials within days of an arrest instead of months or even years as it sometimes played out, and ending cash bail for most misdemeanors and nonviolent felonies. Another change reduces the maximum sentence for “Class A” (the most serious) misdemeanors by one day, making it 364 days. This is significant because it means that people who are in the country illegally and are convicted on that type of charge won’t immediately face deportation — whereas a 1-year sentence previously could trigger deportation proceedings. Another provision allows the closing of three more state prisons, because of a continually decreasing inmate population. Lawmakers renewed for five years the surcharge applied to individuals who earn more than $1 million annually and couples earning $2 million or more. First enacted after the 2008 stock market meltdown, the surcharge generates $4 billion a year for the state. 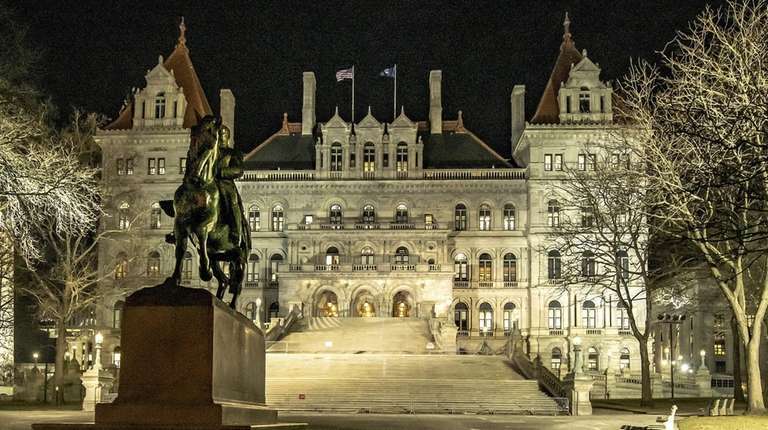 Cuomo and legislators are trying this one again after courts struck down a previous tax as an unconstitutional intrusion on interstate commerce. This time, it’s restructured as a fee (by weight of the prescription) and companies are allowed to pass the cost on to customers. Lawmakers renewed the state’s film tax-credit program. It costs New York about $420 million annually — the single-biggest business subsidy in the state, according to some analysts. Supporters say tax credits more than pay for themselves by generating even more than $420 million in economic development. Cuomo had proposed prohibiting law enforcement from releasing booking information and mug shots from arrests unless doing so serves a public protection purpose. After some blowback, lawmakers said they changed it to apply only to mug shots; booking and arrest info would remain public. One provision would increase the number of days from 14 to 28 that a patient can be in a treatment program before an insurer can review the need for such services, ensuring four weeks of uninterrupted treatment. Under a new law, everyone in a passenger vehicle will have to wear a seat belt, not just those in the front seat. A new law allows a person to take up to three paid hours off on Election Day to vote, as a way to offset long voting lines in some polling places. The 2 percent cap typically has been renewed every few years by popular support. Gov. Andrew M. Cuomo pushed lawmakers to change the cap’s status to “permanent,” making it harder to rewrite or kill it. Lawmakers approved a plan to hike school aid 3.7 percent, or about $1 billion, bringing the overall total to $28 billion. Legislators agreed with Cuomo to change how STAR works for homeowners whose household income falls between $250,000 and $500,000. Instead of seeing their STAR exemption applied up front to reduce their school tax bill, those homeowners would have to pay the full bill first, then later receive a check from the state for the equivalent savings. Cuomo officials say it will improve accountability. Congestion pricing passes without key detailsThe price of the tolls at 60th Street in Manhattan will be determined at a future date.